People have always expressed their devotion to their gods through art. As archaeologists continue to find new artifacts all over the world, it is evident that ancient civilizations from the Babylonians to the Egyptians were very religious. Their drawings, sculptures, lamps, documents, and carvings have taught us about their beliefs and how they lived. One of the most recent finds is a carved snake-shaped rock in the Tsodilo Hills of Botswana, said to be one of the earliest evidence of people performing rituals. Art has also played a large role in the occult world. Occultists have used art to express many things, including emotions, sexuality, mystical experiences, spirituality, astrology, and the afterlife. Magical art is living art, — it makes the viewer feel something powerful and creates a change in them. This kind of art is not just an image on a canvas, but a gateway to something bigger. When I first began creating Satanic art, it was to honour the demons. I drew their sigils on paper, coloured them with markers, and then consecrated them with a tiny amount of my blood on the bottom left corner. I framed them, and then hung them on the wall around my front door and windows. This was for protection, and as a sign to other spirits that Satan and the demons were honoured in my home. At first, these paintings were private work, meant only for myself. 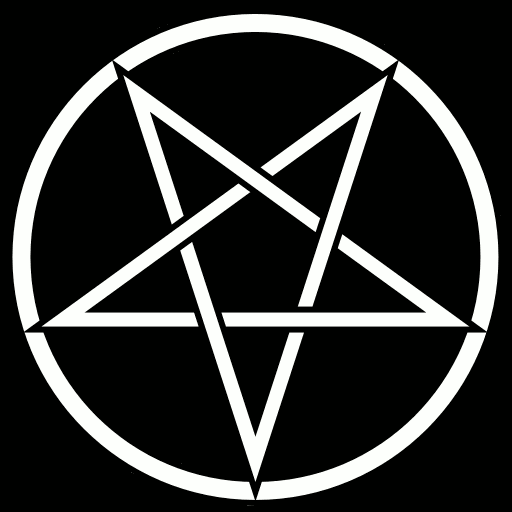 But after having visited a few art galleries, I noticed that there wasn’t any Satanic art. Even though I didn’t have much confidence in my artistic ability, I wanted to change that. So I bought some canvases and paint, with the hope that I could honour Satan and the demons through images and colour. I also wanted to connect with Satan in a deeper way, and I believed that Satanic art was a way to do that. Before I began painting, I promised Satan during a ritual that everything I was going to paint would be dedicated to him, just as I did with my writing. I don’t see a point in creating something that is not Satanic in some way. I like drawing shapes, as they are fun to paint, but I need to add a pentagram, sigil, or a representation of Satan to consider the painting valid in my eyes. Although I am a Satanist and these are my personal practices, they can easily be adapted to fit anyone who wishes to pursue devotional art. I consecrate all my brushes and tools before I use them, and they are set aside specifically for this purpose. I have extra brushes that I let others use if they are going to be painting with me, but I don’t let anyone else use my consecrated tools. I paint in the same room as my altars to Satan and the demons. This space has been consecrated to be used only for ritual and devotional practices. I have an art table set up that is close to the altars, so before I begin to paint I pray, light devotional candles, and burn incense. This is to honour Satan and help get me in the right frame of mind for this work. When I am ready to begin a new piece of art, I go before the altar and ask Satan if there is anything he would like me to paint. I sit and meditate and listen to what he might tell me. If I don’t get a message, I will either wait for another few days or begin to paint something that I believe will honour him in some way. Sometimes inspiration just comes to me, so I will work on that idea and as I do, Satan will often guide me on what to do next. 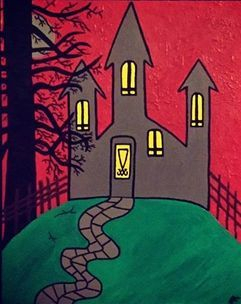 Before I put the brush to the canvas, I dedicate my new endeavor to Satan or to a demon. I take as long as necessary to choose the colours I think will be best for the image. I prefer dark colours, but lately, I have started to use some brighter colours in order to challenge the stereotype that everything Satanic must be black and red. Satan, come and guide my hand. Move it according to your will. When I have completed the painting, I sign my name and anoint it with a small amount of my blood. Then I go before the altar, thank Satan for guiding me, and offer him the painting. I ask that his Will be done through the painting in whatever way he wishes. I leave the painting on the altar for a few days, and then hang it up in my home. The amount of time that it takes me to finish a painting depends on how complex it is and when I feel the inspiration to paint. I go through periods where I paint a lot but then I won’t touch a brush for a couple of months. When I get an idea for a new painting, I will start the process again. If the painting is part of a magical working, I will incorporate some of the blood into the image. I might use menstrual blood, or blood that I get from cutting my left hand or pricking my finger. Originally, I had no intention of letting anyone see my paintings except for family and friends. But over time, I realized that by just letting them hang on my walls, they would remain stagnant. I wanted them to make a difference for Satan in some way. I began to look for ways that I could share my work with others and found an art show that was happening in my city. Two of my paintings were accepted, and for just over a month they hung in a gallery. And this wasn’t a dark art gallery. The feeling of knowing that eyes that would not normally see Satanic art would be looking at my paintings that honoured Satan and the demons was indescribable. Since then, I have put more paintings in art shows of different kinds, and this has given me the opportunity to talk with others about my beliefs. People look at a sigil or image and want to know what they mean. 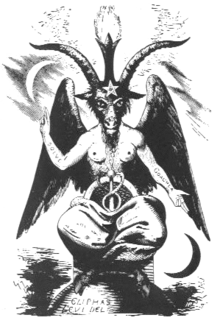 I want Satanic art to have a place in different settings, especially where people who visit are not familiar with it or only expect to see stereotypical images. I believe this is very important, as art is such a powerful medium to manifest beliefs and ideas. Satanic art has given me another way to express myself. It has been a form of magical and spiritual therapy. 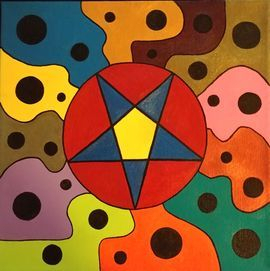 Even though my work is primarily devotional, I have used magick in some of my paintings to manifest both inward and outward changes. It has strengthened my connection with Satan and the demons. But what is most important to me is that Satan’s Will be made manifest. If I can have a small part in that by creating, then I have succeeded. J.R. Minkel. “Offerings to a Stone Snake Provide the Earliest Evidence of Religion,” Scientific American, 1 December 2006. This article was first published by Spiral Nature in March 2018.